APwin is a Windows-front for Alybadix/Fairybadix and Popeye. After a tremendous work Paul H. Wiereyn (NL) has completed APwin v2015, which supports also the popular free chess problem solving program Popeye! I’m happy to announce the judge of informal tournament JF-2015/II – Ofer Comay – a problem composer of all genres, and a former world champion in chess solving. Ofer is also known for his theoretical contribution in end-game study theory and he is the author of one of the first chess problem solving program (CS) in the early 80’s. In the last years Ofer is focused on fairies and helpmates. 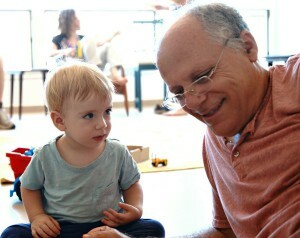 He is also involved in other projects – a co-founder of a software company and the author of the popular science book “Science or Fiction?” which, in short, tries to show to every science amateur that a central part of the standard model of particle physics is a bluff… Ofer has three children and two cute grandsons. You’re welcome to participate in the second informal tournament of this year – JF-2015/II, July-December! (30.08) No.879 – Karol Mlynka (+2; Ultra Schach Zwang; White Super-Transmuting King; PAO; Lion; Grasshopper). Lacny cycle 3×3 on the same square “h4″. (30.08) No.869.1 – Kenneth Solja (h#2; Back-to-Back; Moose; Sparrow). This problem replaces No.869 and shows Back-to-Back alone with the same fairy neutral pieces. (28.08) No.878 – Torsten Linß (s#7; Princess; Empress; Diagonal Helix Knight). Interesting twins with a change of exotic fairy pieces. All previously published problems you can find in the subsections of Original Problems menu on the top. The judge of informal fairy tournament JF-2015(II) – not appointed yet. The judge of Retro and PG problems 2015-2016 – Thomas Brand. A new version of WinChloe, 3.32, released in August, 2015! See the readme with new conditions and themes programmed. Among new conditions there’s Disparate PY (white&black) discussed on JF. The Echecs database is updated as of 12-Aug-2015; with number of problems 583365, among them 591 problems from Julia’sFairies. Thanks a lot to Christian Poisson and to those who fills in the database! (25.08) No.825.1 – N.Shankar Ram (r#2). A revised version to No.825 – “position is now legal (and one piece lighter)” (Author). I hope, the judge, Kostas Prentos, will accept this version for JF-2015-I. (25.08) No.876, 877 – Valerio Agostini. Two different problems: No.876 (h#2; Annan Chess) – a nice Annan four-man; No.877 (hs#3) – orthodox pieces in hs# of ANI-type. No.875 (h#1.5; Super Circe; Andernach; Anti-Andernach; Royal Orphan). (24.08) No.872, 873 – Vladimir Kozhakin (h#2; Einstein Chess). Two light Einstein-Merediths. (24.08) No.871 – Rainer Kuhn & Franz Pachl (hs#3; Half-neutral Nightrider). Rich strategy with final moves by half-neutral piece, previously shown by Franz Pachl in the problems for the 1st Riga Black Balsam TT. 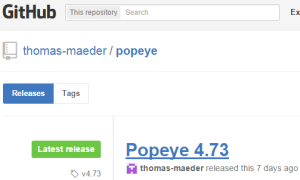 Also, in August,2015 Popeye is moved from sourceforge.net to github! For now three releases of Popeye (4.69-4.73) are available at Releases menu. Thanks a lot to Popeye team for their work! (22.08) No.870 – Georgy Evseev (hs#3; Anti-Circe; Royal neutral pawn). Specific pins in Anti-Circe play with Orthodox Queen. (22.08) Fairings No.44 – Chris Feather, distributed by Stephen Emmerson, is added to the Articles section! (18.08) No.869 – Kenneth Solja (h#2; Back-to-Back; Face-to-Face; Moose; Sparrow). A combination of Back-to-Back and Face-to-Face conditions in a play of fairy neutral pieces! (17.08) No.868 – Ladislav Salai jr. & Michal Dragoun (h#2; Grasshopper; Rookhopper). Zilahi in four solutions with active use of Hoppers. Dear Friends, I’m happy to let you know that I have got 3(!) Awards to publish – all three informal tournaments of JF-2014: by Vlaicu Crişan, Dmitri Turevski and Kjell Widelrt. I’ll try to publish about 5 more problems I have in the waiting list, and than will need some time to prepare for publication the Awards. 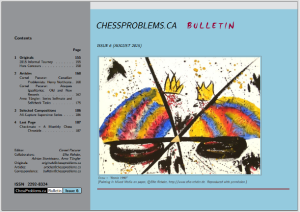 (16.08) No.867 – Michael Grushko & Semion Shifrin (pser-hs#6; Half-neutral pieces). Half-neutral pieces in Pser problem. (13.08) No.866 – Vlaicu Crişan & Eric Huber (ser-s#6; Half-neutral pieces). Reciprocal battery creation in an excellent Meredith position (Black Rex solus in the beginning)! Well, I have the luck to be able to compose practically in all genres. Thus, in my book there are orthodox 2 and 3-movers, but also moremovers because, in orthodox, my preference goes today to strategical moremovers. And a lot of fairies with the Circe condition, or conditions derived from Circe… but also with less usual conditions, like Imitator… and this, sometimes combined with fairy pieces. The book also shows that I like retros, especially fairy retros… even sometimes with mathematical contents. The book has 325 pages. It is written in English. It contains 251 problems and approximately 1001 promotions!